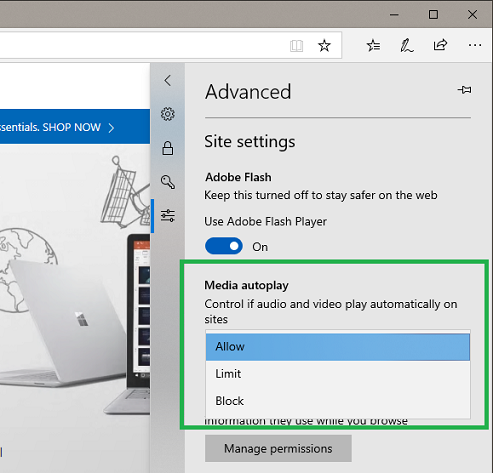 Microsoft Edge provides customers with the ability to personalize their browsing preferences on websites that autoplay media with sound in order to minimize distractions on the web and converve bandwidth. 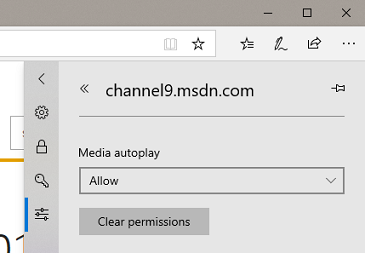 Additionaly, Microsoft Edge automatically suppress autoplay of media in background tabs. Allow is the default and will continue to play videos when a tab is first viewed in the foreground, at the site’s discretion. Limit will restrict autoplay to only work when videos are muted, so users are never surprised by sound. Once the user clicks anywhere on the page, autoplay is re-enabled, and will continue to be allowed within that domain in that tab. Block will prevent autoplay on all sites until users directly interact with the media content. Users can control the default autoplay behavior for all sites under Advanced Setting > Media autoplay. Users can control autoplay behavior on a per-site basis under the Website permissions section of the website information pane. This setting can be found by clicking the information icon or lock icon on the left side of the address bar and clicking on “Media autoplay settings” to get started. Per-site settings override the global setting. For example, if a user has their global setting set to “Allow” but changes a per-site setting to “Block”, autoplay will be blocked for that site. Ensure that media controls are always present on both site media and ad content. This will give users the ability to restart playback if autoplay is blocked on the page. Evaluate how autoplay may affect users’ experience on your website and consider using autoplay in a way that minimizes unwanted media playback. If autoplay is a crucial part of your experience, consider using muted content to start and allowing the user to unmute it. For muted content to autoplay, the audio source must be either explicitly muted or not be set. Otherwise the element will not be considered as muted. Unless absolutely necessary to do otherwise, use the native browser controls for media playback. This will ensure a consistent experience for users. If you are building custom controls instead, ensure that media controls are always present and that your controls properly react to autoplay suppression. Autoplay in an <iframe> will inherit the autoplay permission from the parent page regardless of content origin. In a playlist scenario where each media file is hosted by a separate iframe, the user would only need to initiate playback once for the entire playlist.